Distribution of AirPlay source over Multiroom is possible, however it is not enabled by default. To enable it, open your Bang & Olufsen app and select the product you want to use as a source. Go to the product settings and then select "YOUR CONTENT" - "APPLE" and enable the check box "Enable Multiroom for AirPlay". Then save the settings by clicking the "CHANGE" button. 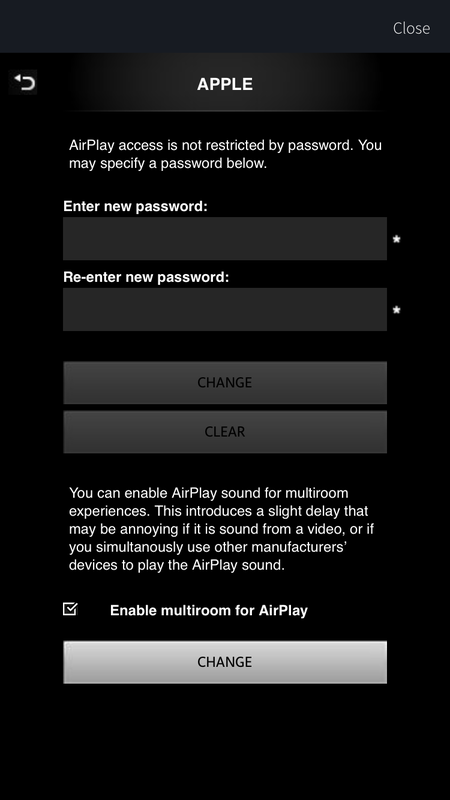 AirPlay Multiroom distribution introduces a small latency in the sound. This is not perceived if your source, on your mobile device, is an audio app. However, if it is a video app (e.g. YouTube) you will notice a slight lipsync artifact, which means that the video image and the sound are not in perfect sync. Therefore, it is suggested to enable the AirPlay Multiroom distribution only if you use it with sound sources. This is also why it is not enabled by default. If you have multiple Bang & Olufsen products and you want to enable Multiroom distribution from all of them, you need to enable the feature in each one of them individually. AirPlay Multiroom distribution, once enabled, works also towards Bang & Olufsen TVs as well as in integrated setup / "speaker sharing" mode between an AirPlay Bang & Olufsen product and a Bang & Olufsen TV. How do I enable Google Cast?